Your young child is growing, developing, and maturing every day. As they encounter the world, they are discovering the principle of cause and effect, and this is boosting their brain development. In our last blog, we looked at five general areas that early education can help every young child to learn, but today, we’ll take a deeper look at cognitive development and what you can do to help your child to grow in the area of cognition. Cognitive development is just a fancy way of saying that your child is developing more skills in thinking and understanding. This boost in “brain power” will help your child to get a healthy start in academics once they start school. Researchers estimate that children begin to understand that one action can cause a reaction as early as 8-12 months of age, and as they develop this understanding, they will begin to investigate ways to recreate the experiences that they enjoy. 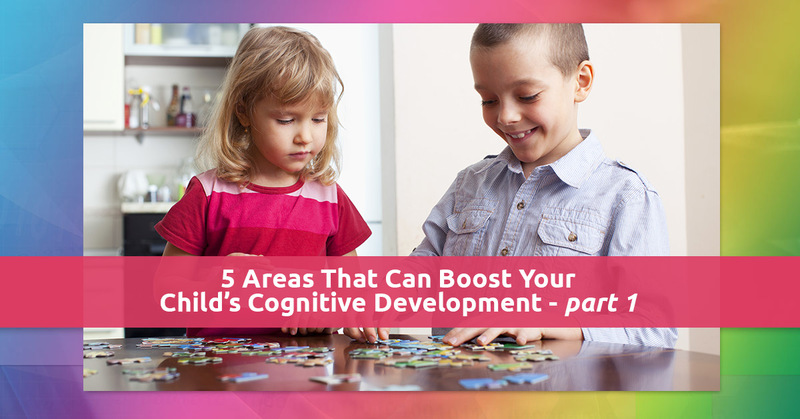 Every child should be developing their skills in these five areas of cognitive development. We’ll share some simple techniques that you can use to help your child to have fun while developing in these areas. Your child’s attention span will vary with your child’s age, but no matter what age your child is, you can work with them to gently stretch their attention span. Know what the hardest part will probably be? Letting your attention span outlast theirs. Whether it’s an endless round of “peek-a-boo” or yet another storybook, you may find yourself tempted to run for your phone long before your child is tired of your time and attention. However, just remember that for every moment that they’re investing their solid, undivided attention and focus into something, you’re helping them to develop key skills that will help them all through life. Perhaps counter-intuitively, screen time actually decreases your child’s ability to pay attention. Why? While they’re absorbed in their favorite movie or show, they’re wrapped up in a sort of hyperfocus where they’re not aware of other things going on. The attention that you want to develop is the kind where they learn how to choose to pay attention (and choose to keep maintaining that attention even when they’re aware of distractions or their initial interest starts to naturally fade). Memory also begins early, and even though your child typically won’t retain their earliest memories into adulthood, they can remember things on a short-term basis. You’ll notice it, for instance, when you see a child go back to the exact place where they left a special toy. For older preschoolers or kindergartners, begin to introduce games like Memory (where you flip cards upside-down and try to find the two that match). Also, try showing them a tray of items for 30 seconds and then hide the tray. Give a small prize (like a Cheerio) for every item they could correctly name. Stay tuned for our next blog, when we’ll cover three more ways to help your child to have a head start in cognitive development. In the meantime, contact Rainbow Chimes Daycare for a tour of our facility. To start the enrollment process, click here.